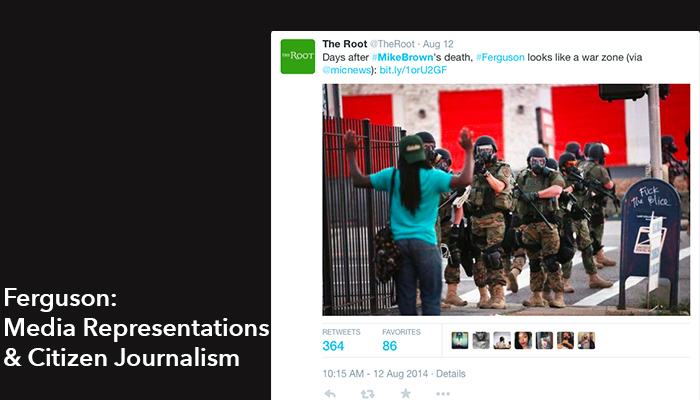 Episode 24 focuses on media representations of Ferguson, Missouri after the killing of Mike Brown. As Ben notes in the introduction, This Rhetorical Life focuses on the practice, pedagogy, and public circulation of rhetoric. By focusing on Ferguson, we connect all three: how rhetoric circulates around Ferguson, how our public texts work to either create and sustain or to challenge and resist unjust systems, and how we as writing instructors can help students analyze and flip unjust systems. This episode features interviews with three Syracuse graduate students: Tessa Brown, Sherri Williams, and Nikeeta Slade. The music sampled in this podcast is “Strange Arithmetic” by The Coup, “Note Drop” by Broke For Free, “EMO Step Show” by The Custodian of Records, and “This is the End” By Springtide.